Recent development in nanocomposite technology using organoclay as nanoscale reinforcement offers an interesting alternative for modifying epoxy resins. The new patented process enhances the degree of exfoliation of the organoclay and breaks up the agglomerates. 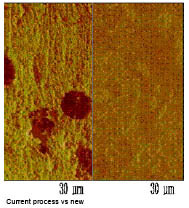 The nanocomposites formed showed a dramatic improvement in mechanical properties at very low clay loading. Will be of immediate use to the producers of resins used for making composite materials, adhesives, sealants and other applications. These materials are in turn used by manufacturers of aircrafts, automobiles, sports equipment, and components for pipes, boats, reservoirs, etc. Technology available for licensing. Looking for strategic partnership with producers of resins used for making composite materials.